I love a new product. I’m a sucker for them. Especially cleaning products. I had the first Dyson vac, which was so heavy I lost my big toenail the first time I used it. 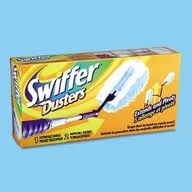 And remember The Swiffer? I wandered around the house like the lady on the advert showing my dust to anyone who would look. Dishwasher products were my fad for a bit. But after extensive powerball research, I can exclusively reveal that cheapo powder works best. Fact. I draw the line at air fresheners, though. I tried one out once in the playroom, but strangely I never experienced the ‘Tibetan peace chimes’ or the ‘freshness of a mountain stream’, when I opened the door. Only rotten apple core and something unspeakable on the bottom of a discarded trainer. Beauty products are another one of my early adoption vices. It’s always been so. Who can forget Apri, a ground-up almond facial wash that took the entire surface of your skin off? That certainly got rid of my teen blackheads. So you’ll see it follows that when my local supermarket recently brought in a scanner system, where you could scan your shopping and plop it straight in your bag – or in my case, my fetching granny trolley – I was chomping at the bit to sign up with my jazzy pink store card. I was an immediate convert, shouting loudly about my super speedy shopping. It was all going swimmingly until I went shopping with the Middle One at Christmas. The crafty Miss managed to sneak in a big tin of Quality Street into our trolley. When we came to pay, smugly bypassing the huge queues at the checkout, they demanded a rescan and we were nicked. So now I’m on some kind of blacklist. And every time I shop, more often than not, I get asked for a rescan, even though I shop there all the time. So, on Monday, Emlyn and I went shopping together. Bad mistake. Shopping solo is surely one of the true benefits of being married for over ten years. I picked up my scanner, ‘Welcome Mrs Rees,’ it told me, ‘Thank you,’ I said, taking it out of the slot, Emlyn pulled a face and told me that it was another new-fangled fad of mine and it took far long. ‘You’re wrong,’ I told him. ‘I shall prove it.’ So we did our shop together in a rather scratchy way, him harrumphing about me carefully scanning everything. But when we came to pay, infuriatingly, I was asked for a rescan. The look on Emlyn’s face sent me orbital. I had to ask him to leave the store, so I could loose my rag in private. I have since had an email of apology from Customer Services about the subsequent ‘scene’, but it’s taken me all week to get over my sense of injustice. Having not being back to the said supermarket in protest, we went to the other one across the road to buy some Special K this morning (as you do). I was amazed when Emlyn chose to use the self service checkout. Fool! ‘It won’t work,’ I gloated. Besides, he didn’t want a bag, didn’t have a Nectar card and was paying with a fifty pound note. The machine can’t cope with that. He had to call the assistant….twice…and ended up going to the checkout when the self service machine self combusted. So it’s not just me. Which leads me to conclude that the moral is that it’s all very well to be an early-adopter, but old-fashioned bottle bleach and Pond’s Cold Cream still work the best. And in life, sometimes you just can’t avoid the checkout.